Worldwide spread family of hemispherical, flyable beetles, whose cover wings usually have a different number of conspicuous points. The most significant species is the seven-spot ladybug (Coccinella septempunctata) for its predatory performance against pests. But there are many other types with 2, 4, 5, 7, 10, 11, 13, 14, 16, 17, 18, 19, 22 and 24 points. 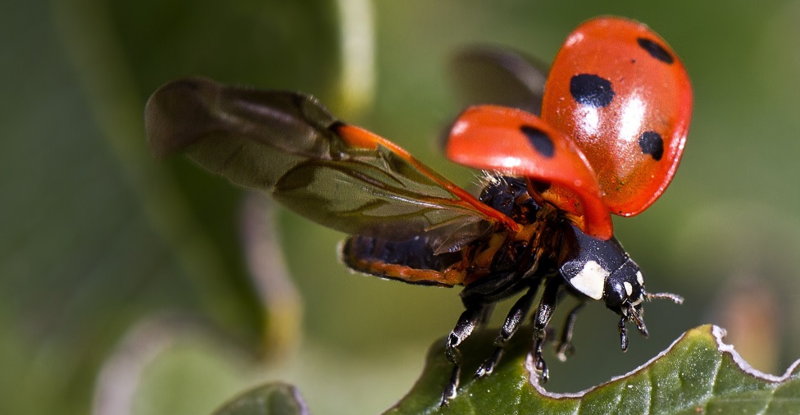 The five-to-eight-millimeter seven-point ladybug (also known as God beetle or lucky beetle) is red to reddish-yellow to black and has seven black spots on each of the upper wings. After hibernating as beetles, the animals leave the neighborhoods from the end of March and lay yellow, oval 1.3-millimeter-sized eggs in cracks of stakes from the end of May. In June, the running larvae mainly colonize the leaves of the vines. The development in usually only one generation per year runs from the egg on four larval stages, the doll to the sexual animal; predatory are the larvae and adult beetles. This page was last modified at 7 April 2019 at 13:15.